For 4.6 billion years, life on Earth has evolved. Change has been a constant factor for life on our planet, but human activity has accelerated the rate of change, making it harder for nature to catch up. A new film playing daily at the Aquarium of the Pacific explores human impacts on our planet and ways we can help prevent loss of biodiversity and protect the health of ecosystems. The film is a companion to theVanishing Animals gallery, which opened at the Aquarium this summer and reveals through live animal exhibits, videos, and interactive displays how human activity has contributed to animal extinctions and how humans have been able to help species recover. Viewers can learn how factors like overfishing, pollution, and habitat loss put endangered species and threatened ecosystems, particularly those in the ocean, at risk and what can be done to help. 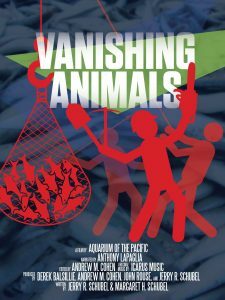 The Vanishing Animals film was produced in house using footage from Alucia Productions and original music by Edward Freeman and Marta Victoria of Icarus Studios. As part of the Dalio Ocean Initiative, Alucia Productions’ mission is to create world-class media that educates and inspires people to connect to the ocean. Plays daily starting September 14, 2016.